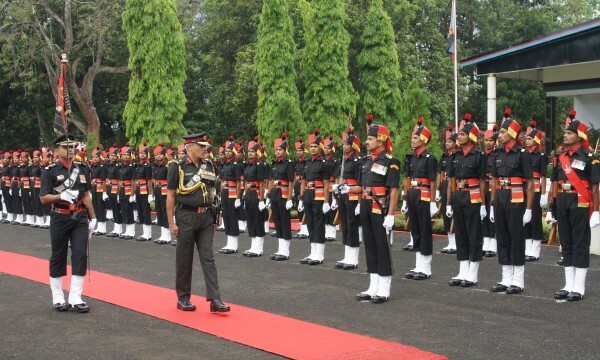 Lt Gen Narendra Singh, Deputy Chief of Army Staff and Colonel of The MARATHA LI was on his farewell visit to The MARATHA LIGHT INFANTRY REGIMENTAL CENTRE, Belgaum. Brig Santosh Kurup, Commandant MLIRC accorded a warm welcome to Lt Gen Narendra Singh. An impressive ‘Guard of Honour’ was presented to the visiting dignitary, after which the General Officer paid homage to the Martyrs of the Regiment in a solemn wreath laying ceremony. Lt Gen Narendra Singh also addressed all ranks of The MLIRC in the customary ‘Special Sainik Sammelan’. It is pertinent to note that Lt Gen Narendra Singh had a long and illustrious career of over 40 years in the Indian Army and was Colonel of The MARATHA LI for nearly seven years. Lt Gen Narendra Singh handed over the baton of the Colonel of the Regiment to Maj Gen PJS Pannu at the occasion. Lt Gen Narendra Singh was bid Adieu by all the Officers, Junior Commissioned Officers and other Ranks of The MARATHA LIRC.